Who's more badass, State College or South Beach? Joe "Coke bottle glasses" Paterno or Jimmy "Grecian Formula" Johnson? For one night at least, the answer was rural Pennsylvania and Coke-bottle Joe Pa. 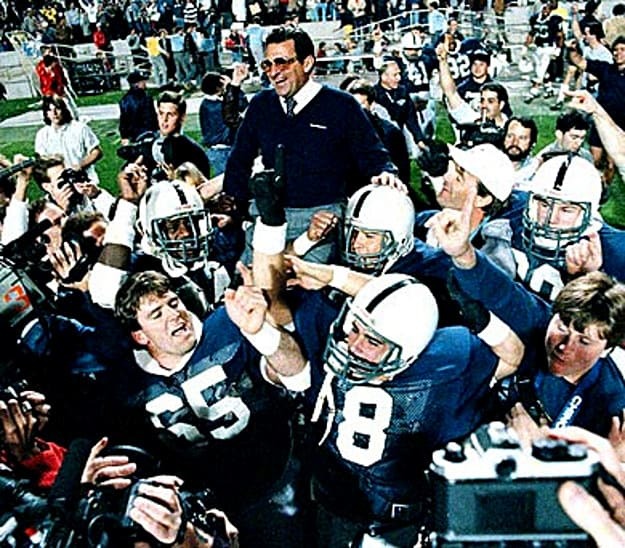 The '86 Nittany Lions had been ranked in the top 10 all season, had beaten then-no. 2 Alabama on the road, and took a perfect 11-0 record into the mythical national championship game at the Fiesta Bowl. But they were an afterthought to the swaggering Miami Hurricanes: an afterthought that is, until they intercepted the U's Heisman Trophy-winning quarterback five times en route to a 14-10 stunner. Needless to say, the parties in State College were considerably more badass than those in South Beach that night.